This isn’t a joke. The Disabled Superhero was created by Liquid Comics and the Open Hands Initiative. 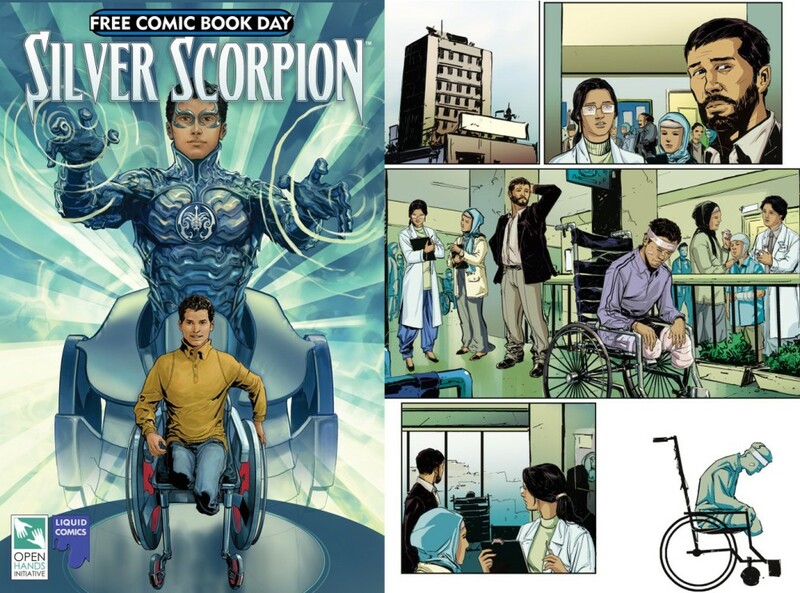 The Silver Scorpion is an Arab teenager who loses his legs in a tragic accident, but whose powers- his creators hope- include the ability to help build bridges between the youth of America and the Arab world, starting with Syria. The first issue of the Silver Scorpion will be given away free across comic book retailers in the United States this Saturday May 7th as part of â€œFree Comic Book Dayâ€. In addition, a digital edition of Silver Scorpion is also now available for free on the home page of Scribd.com where it can be read online and through iPad devices, as well as shared with friends through Facebook and Twitter. A larger, magazine-sized collector version of the first issue is also available for order via HPâ€™s Magcloud print on demand service. Syrian students who took part in the summit said that the collaboration with American children was life-changing. â€œIt made me feel that I have to improve my life,â€ said Abdulrahman Hussein, who wants to learn English so he can meet more people and better communicate with his new American friends. â€œWe hope the character also teaches children with disabilities to overcome the perception of their disability as a weakness, and instead find empowerment and pride in who they are, regardless of their differences,â€ added Devarajan.